under a pile of blankets, dolls, and vintage clothing. Three were translatable from Latin and German. I also discovered Ruthie’s math teacher taught me algebra too. The signatures on more than 70 pink, blue and beige pages reflected Pennsylvania Dutch origins: Blottenberger, Ebersole, Hertzler, Raffensperger, Schlosser, Ulrich, and Wolgemuth. But I found a Madeira and a Stephens to balance things out. 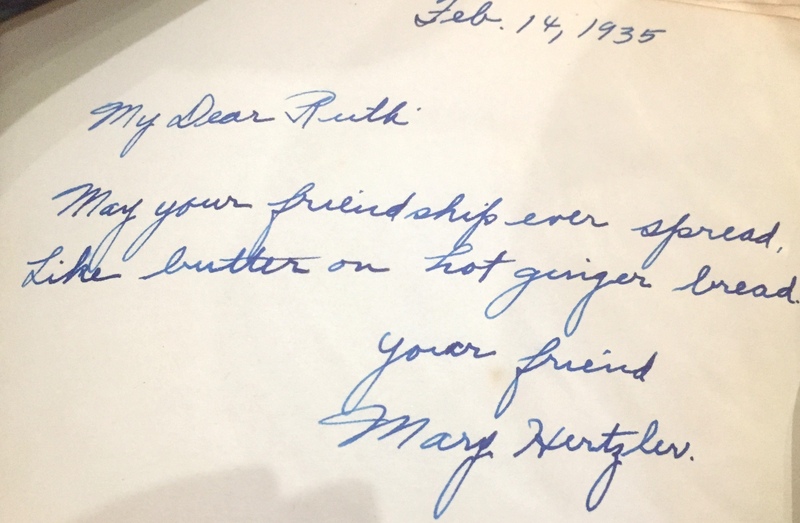 May your friendship ever spread / Like butter on hot ginger bread. Just to make room for all the others / I always write mine back of the cover. May you always be friends with Dame Fortune, / May you never meet his daughter Miss Fortune. It’s hard to lose the boy you love / When your heart is full of hope, / but it’s harder still to find a towel / When your eyes are full of soap. In your chimney of friends, consider me a brick. In the chain of friendship, consider me a link. Here’s till you slide down the banister of love / Into the ash can of matrimony. You’ll go far on your way to success / Whether or not you wear a cute dress, / Always be happy, and always be gay, / Remember tomorrow is not faraway. Always have a star farther than your grasp as your goal. 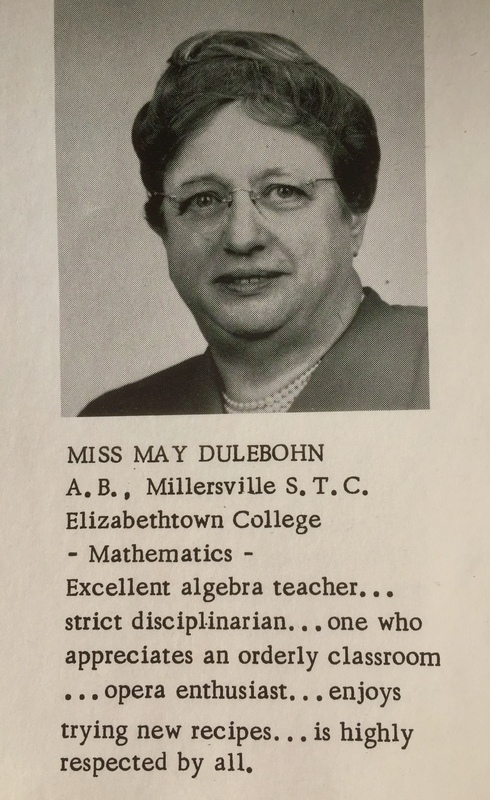 May Dulebohn taught me algebra too but near the end of her career. Who walks the world with soul awake / Finds beauty everywhere. Miss Dulebohn, with her Eleanor Roosevelt-esque hair style, inspired fear and respect as she strode with sure, steady steps up and down aisles of students, expounding the marvels of advanced math. Do you still have your high school year book? An autograph book? Any memorable sayings – sweet, silly, or otherwise? When have you attended a high school reunion? 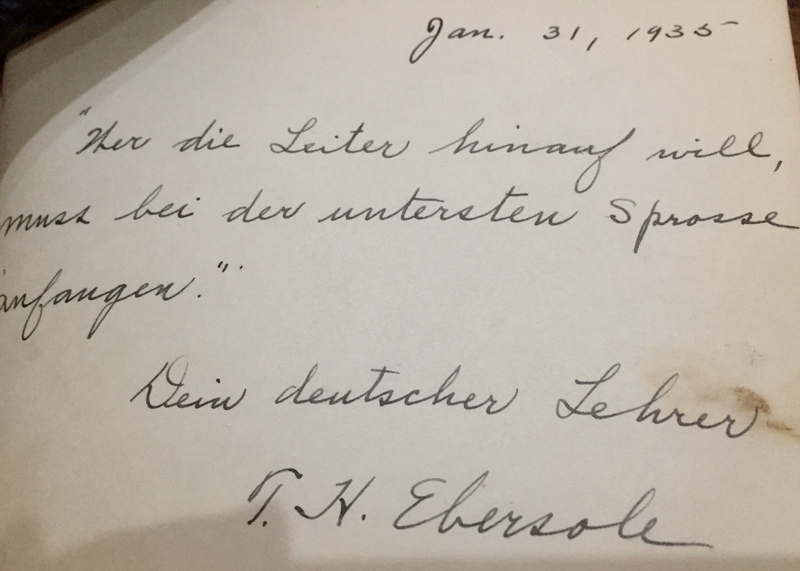 Can you give an accurate translation of the German teacher’s comment? Good Morning, Marian! It must have been so much fun for you to discover this book and go through it–and discover you had the same math teacher as Ruthie. I still have my high school yearbook somewhere. 🙂 I haven’t gone to any reunions. You betcha! 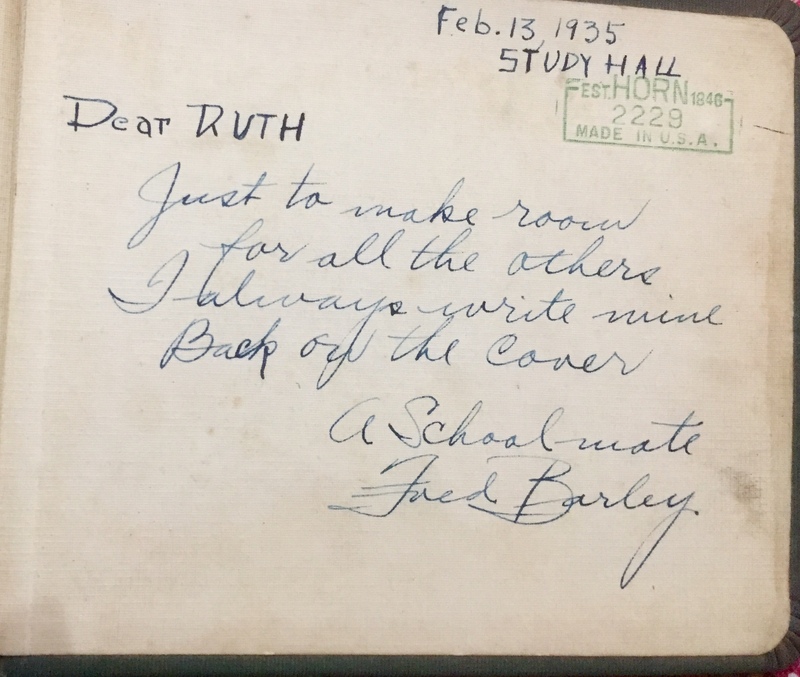 I found multiple diaries too, but Aunt Ruthie favored pencil as her writing tool and her cursive lines are hard to read. 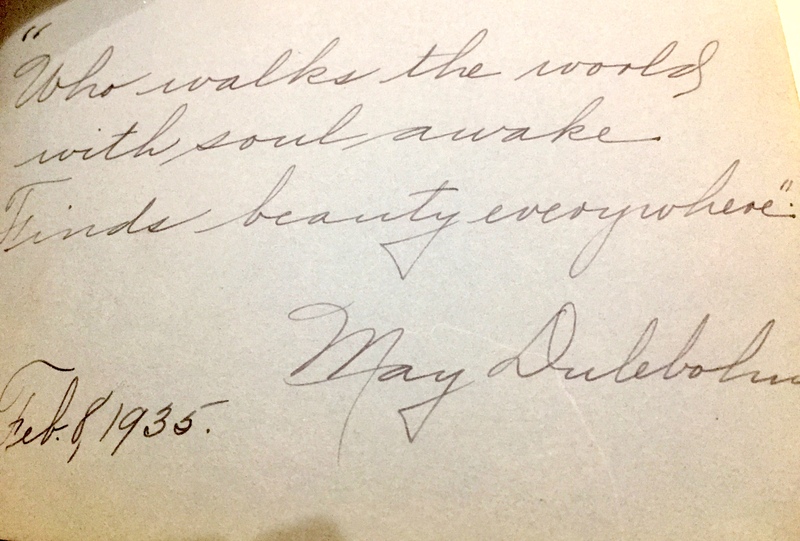 Of course, May Dulebohn taught me near the end of her career, but she was probably only sixty or so. Still, our teachers seemed old to our teenage eyes. Right? Wow! What a blast from the past this post was, Marian. I completely forgot about autograph books. Now I’m wondering whatever happened to mine. I still have my yearbooks and it’s fun to periodically read what people wrote. 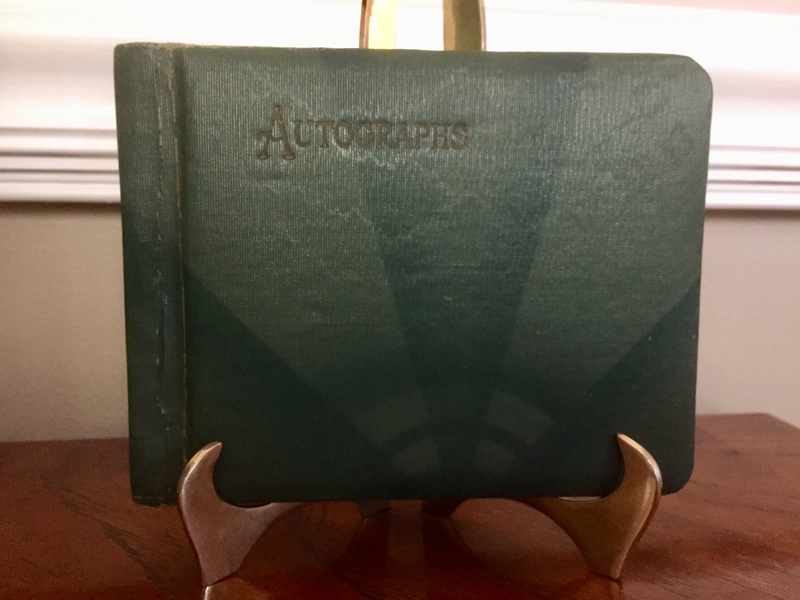 I suppose with the digital age, autograph books have gone by the wayside…what a shame. I’m surprised you had an autograph book, Jill, because I thought they had been relegated to the olden days 🙂 I know you treasure nostalgia and have heard you admit that you prefer mailed greetings as opposed to “Happy This or That” in social media. I agree! Thanks, Jill. 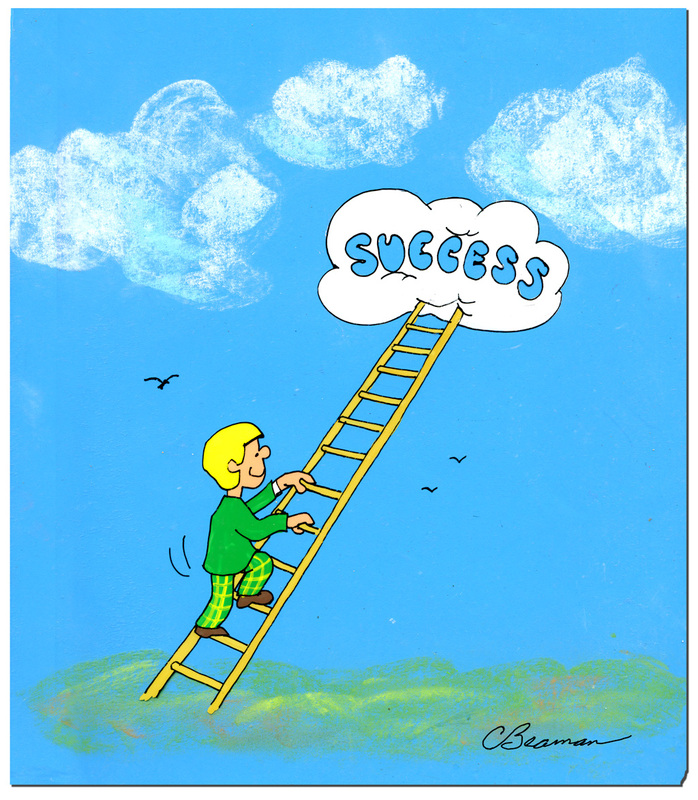 I can’t translate the German teacher’s comment exactly but it is about reaching success by starting at the lowest rung of the ladder. (I figured that out before seeing Cliff’s cartoon!) I love these old autograph books. I think I still have mine and I definitely still have my old year books. Quite a laugh when you look at them now. 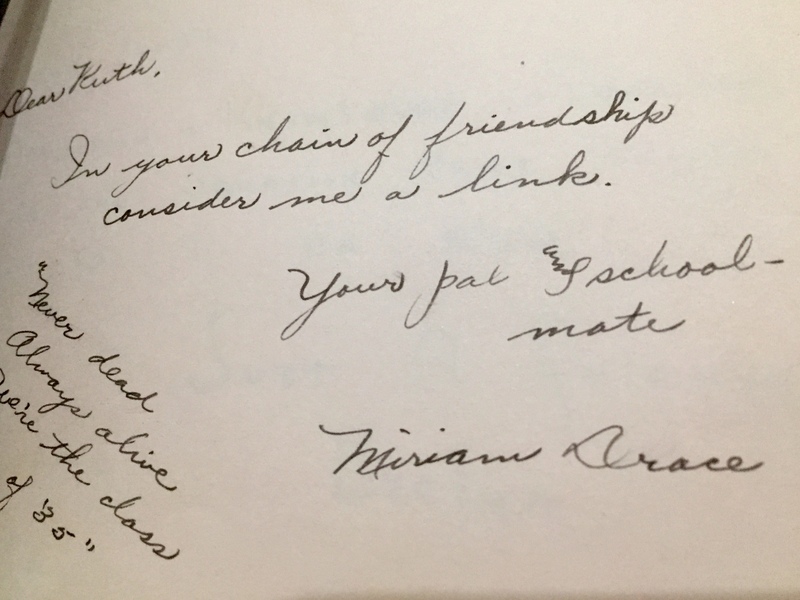 Someone wrote in my book also, In the chain of friendship, consider me a link. Thanks for sharing these. So glad you found this old book, a treasure indeed. Those corny sayings have a long shelf-life and relief our friends from the pressure of having to conjure up more original comments, don’t they. You’re right about the German teacher’s comment. I may have spoiled the de-ciphering by including Cliff’s cartoon, but we found that just a few weeks ago and seemed suitable as a prompt. Thanks, Darlene! What a marvellous find, Marian! Unfortunately, we didn’t have anything like this in our school, but I would have loved it and treasured it. I know you would, Fatima. I’m sure find cultural artifacts of a different sort in your travels. Thanks for posting once again! Oh, this is wonderful, Marian. The language is reminiscent of my Grandpa Paul’s letters to my aunt during WWII..a little corny and silly but a window into a simpler time. Thank you,once again, for sharing your treasures. You are welcome, Kathy. Aren’t we lucky to have access to correspondence from days of yore? It seemed like a simpler more respectful time then, but still our ancestors couldn’t escape frightful news like the Holocaust and Hiroshima. I wonder what treasures will survive our turbulent times. I enjoyed reading all the witty sayings, written in cursive, and the cameos of Miriam and Ruth in their high school yearbook. What a fine bunch of young people! I hope they all had long, happy, rewarding lives. Thanks for commenting here again, Lynn. Miriam and Ruth were first cousins. 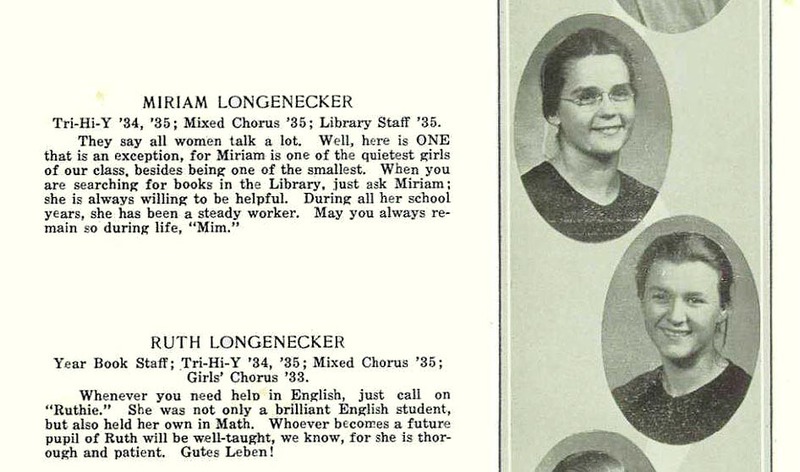 I don’t know much about Miriam Longenecker except that she was very shy and did not live into her nineties like Aunt Ruthie. 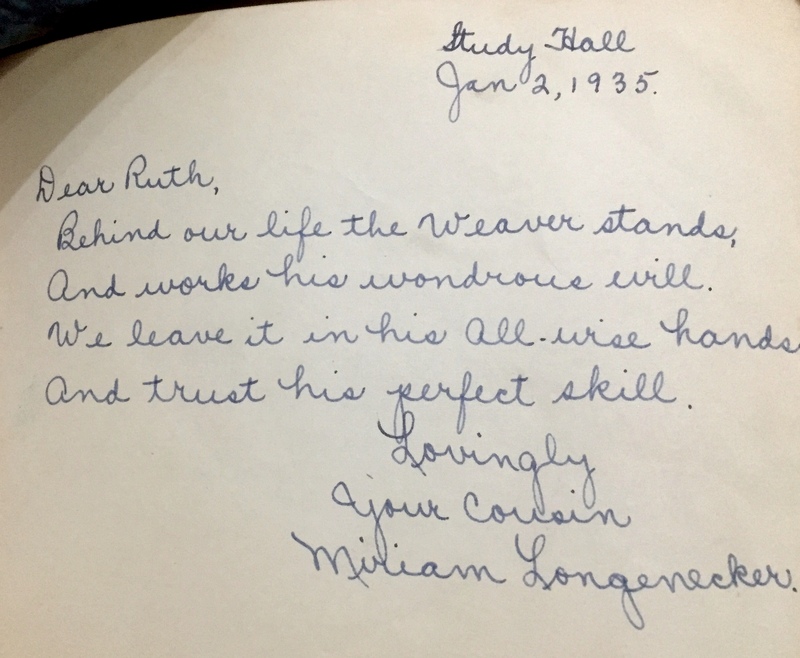 Back in the 1950s, I discovered autograph books in the same place my mother kept her high school yearbook. I loved the silly comments and desperately wanted to be as witty as Burma Shave signs. Ah youth! You are welcome, Shirley. I like to think I am pulling back “the gauze” from what I perceive as a kinder, simpler culture. Love that image – thanks! Such a treasure there is in these pages that reflect a simpler, and kinder, time. I remember autograph books; I may even have one around here somewhere. Like letters of old, they provide a precious glimpse into the past, don’t they? I wonder if it is you yourself or a mother or grandmother with an autograph book. 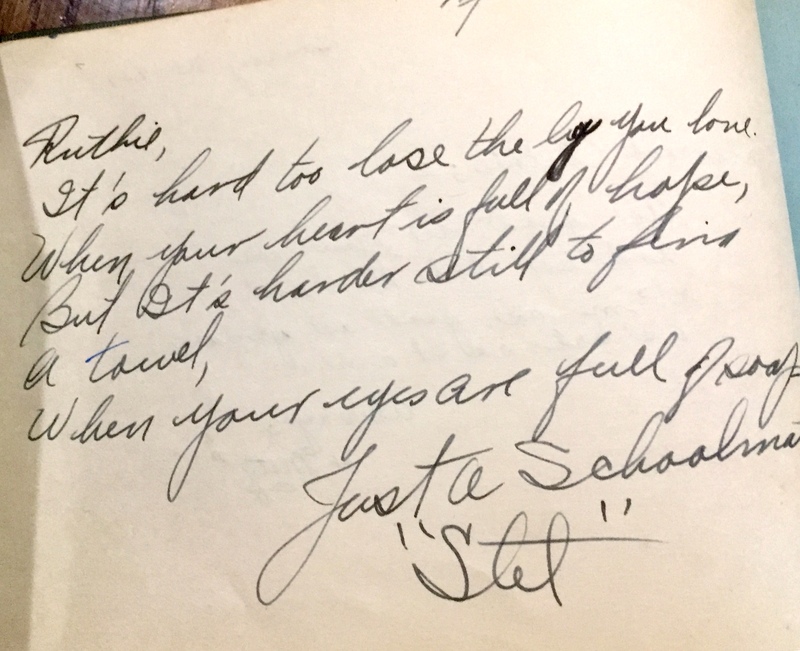 Classmates wrote in my yearbook, but autograph books had gone by the wayside by then. 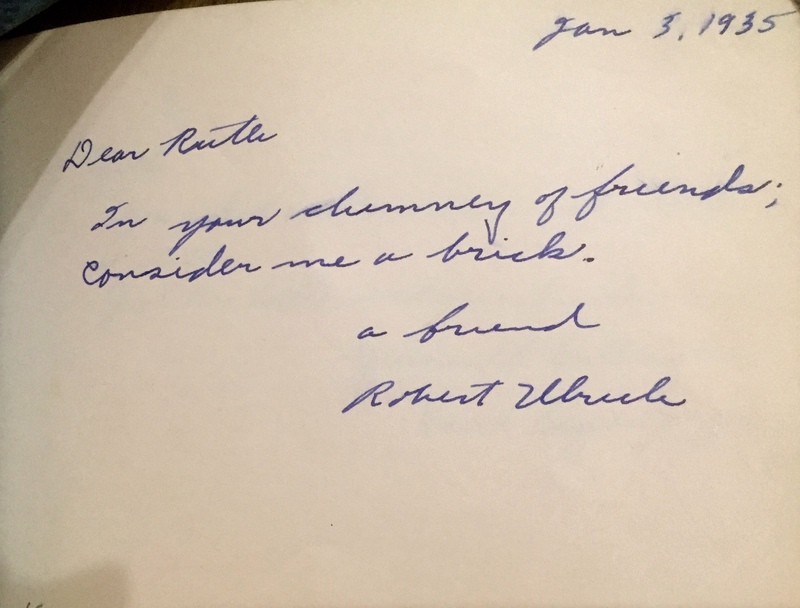 One of my sisters has either my dad’s or my grandpa’s autograph book. Fountain pen ink was used in theirs and the calligraphy was super flowery, surely a photographer’s delight. I still remember autograph books, but haven’t kept mine. I have a “birthday book of good fortune” which I received in my early teens as a prize for memorizing Bible verses in Sunday School. In it you enter the names of your friends and loved ones on their birth dates, and read their fortune. Just a little correction to your German translation “Wer” instead of “were” and “anfangen” instead of “anfaugen”. “Sprosse” has a capital S since it’s a noun. (Sorry, my German teacher personality compels me to do this! Thanks for explaining the “birthday book of good fortune,” an artifact I have not heard of. I appreciate your correcting the German translation, Elfrieda. Knowing your expertise, I was hoping you would comment about this. 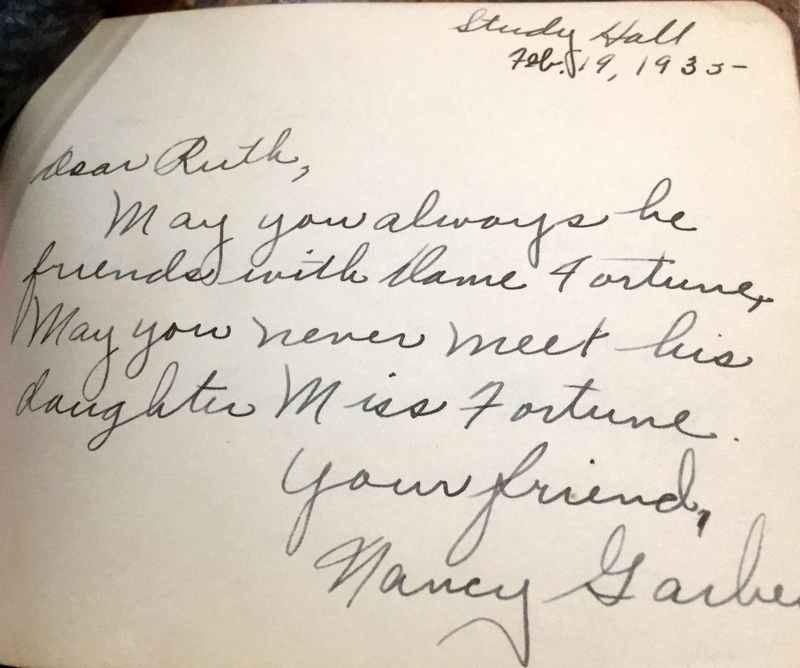 My mother-in-law kept a similar book in her room, filled with good wishes just before they came to Canada. It was worn on the pages so I expect she looked at it a lot to remember the friends she left behind. Talk about nostalgia. This is a prime example if I ever heard one. Thanks for sharing your mother-in-law story, Jean. 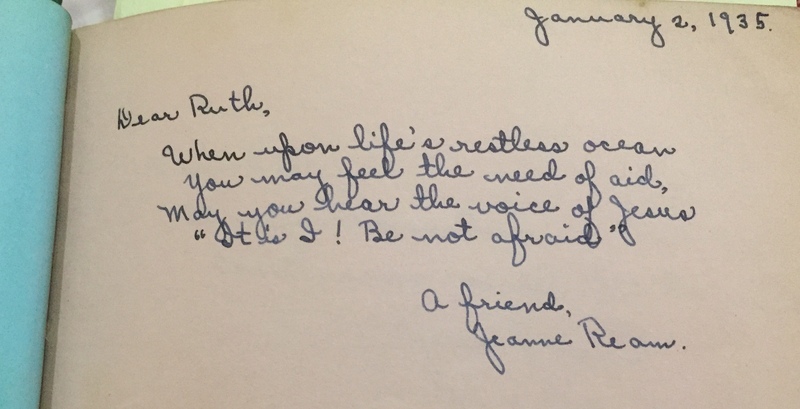 Marian — Opening Aunt Ruthie’s autograph book is like opening a time capsule, it reveals so much about that era. Ya gotta love it! I hadn’t thought about it that way, but so it is: a “container” of sorts for expressions of a kinder and gentler generation. Thanks, siSTAR! Wonder if you were in May Dulebohn’s class when all the Homesies wore pajamas to class one day? She was having none of it, and sent them home………. Oh, my word! I totally missed out on this. We both know it would have been out of character if she had not sent them home. She was certainly one of a kind. Thanks for the anecdote, Jack! I have my junior high and high school yearbooks. Often over the years there have been the “wonder whatever happened to _____” moments. It was a challenging time in my young life, and I have never been to a reunion. Perhaps the 50th, in 2021…. Ginger, you have great aspirations. And probably a mixed bag of memories when you look at the faces in your yearbook. I hope you can attend your 50th. You will probably be surprised by those you meet again. And some, unfortunately, may be absent. We had lost 14 members (deceased) when we met that year. Amazingly enough, autograph books are something I did not keep from way back. They were an interesting and enjoyable formality, in a way. We also had “slam” books. Do you know what I mean by those? Equivalent to today’s slamming on Facebook I suppose — not always pleasant to find out how you rated on various lists. I loved your replay of the familiar lines from the autograph books and funnies; I wish I could remember some silly ones in mine! I do have signed yearbooks and I enjoy them from time to time. I don’t believe I thought slam books really existed although I must have heard about them in bygone years. Just a side note: If you didn’t keep the slam books you won’t have to move them – ever – nor will your children have to puzzle over what to do with them. How’s that for a perk, Melodie? About enjoying to yearbooks, the ones I kept were invaluable doing research for my memoir. I don’t remember any silly or corny comments though. Ha! What a treasure , what a find . 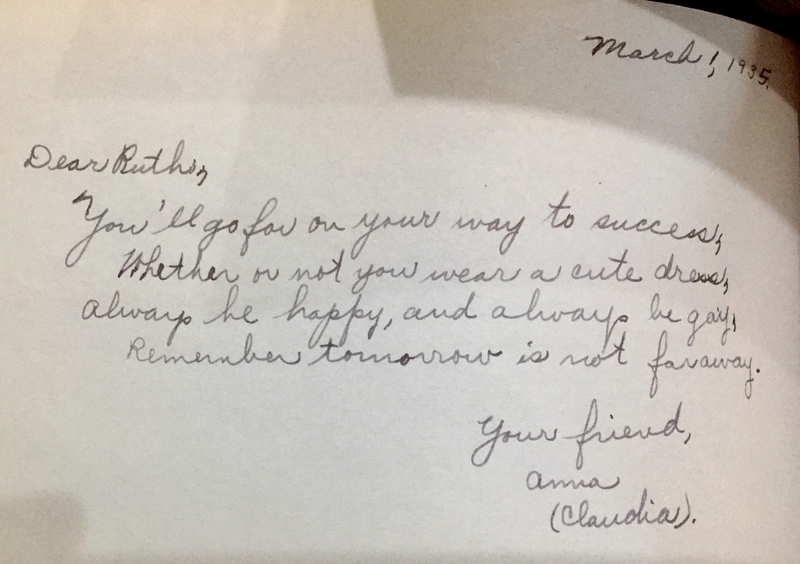 Something as beautiful as your aunt ‘s autograph book can only be found under ‘blankets ,dolls and vintage clothing…it all adds to the mystery doesn’t it . Thank you for sharing it Marian . 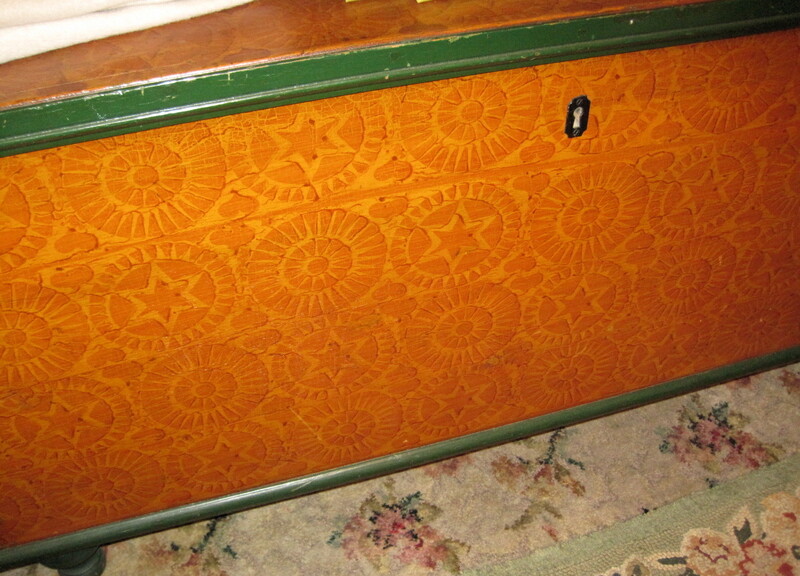 I have something similar that belonged to my Mum . In W.W 2 my Mum , Margaret (Peggy) Dodd , was in the A.T.S and stationed in Windsor . Although it was a terrifying time in my Mum,s life , it was also a liberating one because she was introduced many women from all walks of life . I own a tiny book with names and messages of that period in her life and I trullly treasure it . I have no idea who these women are I can only imagine …amazing . You have disturbed a few moths today Marian I thank you for that . What a precious book to cherish.! We visited Windsor years ago and were treated to a fantastical parade. Those who defended your country during that terrifying time made our enjoyment possible. Praises be! I love your phrase “disturbed a few moths” . . . so descriptive of Aunt Ruthie’s attic charms. Treasures in the cobwebs and so on. Thank you, Cherry! These are such wise sayings Marian thank you! I haven’t kept year books – too many schools but I have kept diaries from when Moses was a boy. Re school reunions – yes I’ve just attended one (the one and only I’ve ever attended) here in Somerset West (outside of Cape Town) this past Saturday! It was quite something -people came from Australia, Canada, US, NAmibia and elsewhere. A few from Johannesburg. I am so impressed that classmates from all over the world, literally, came to your class reunion. Quite an investment in time and money for many of them. How fortunate everyone congregated in Cape Town. You must look very chic with the vari-colored strands of hair in the process of going au naturel. Your comment is so appropriate to the theme today. Thanks, Susan. Thanks for sharing this! Ah yes! I have all my old year books, I even have my dad’s! I love reading what fellow students and even a few teachers have written to me or about me. I just recently gave my autograph book to the history department of my church headquarters because it had sayings and signatures of bishops, evangelists, quartet singers, and so many more! I received a letter thanking me for sending it to them as it would make an interesting item, in the new history display, with so many well known signatures! You are generous to donate because many will appreciate your bequest long after you and I are gone. I say “I” because my sisters and I donated a German Bible we think was brought over from Switzerland 🇨🇭 and also two land deeds with the signatures of William Penn’s sons. They are housed at the Anabaptist Pietist Center at Elizabethtown College, PA.
You are so blessed with a wonderful heritage and surrounded by others who appreciate it all. Thanks, Anita. You found a real treasure! I certainly did! And now that I have scanned the photos, I guess I’ll have to think about what to do with the book itself. I’m Guessing you store all your photos digitally, Fiona. Yes? Wow, those are some good quotes! I wish I’d been as pithy back in the days when I was signing yearbooks! Yes, Rebecca. Corny might even be considered cute or clever then. Ha! These are so great, Marian. People were very considerate, funny, smart and rhymy those days. Such treasures. We don’t have year books in Belgium, but when I was in primary school, we had a little book with thick, blank pages that we passed around to collect drawings from our teachers and friends. And, we had “Friend” books, where other children would answer questions like their age, color of their hair, hobbies, “best friend”… I still have those, but only from myself. I love the idea of blank pages for drawing as remembrances . . . unique! I wonder if anyone drew cartoons of teachers. And the notion of “friend” books is fantastic, also with a little interaction involved. It is great to hear about customs in Belgium in this column. Thank you, Liesbet! Isn’t it fun to read those and see how students spoke to one another in those times and things they wrote? 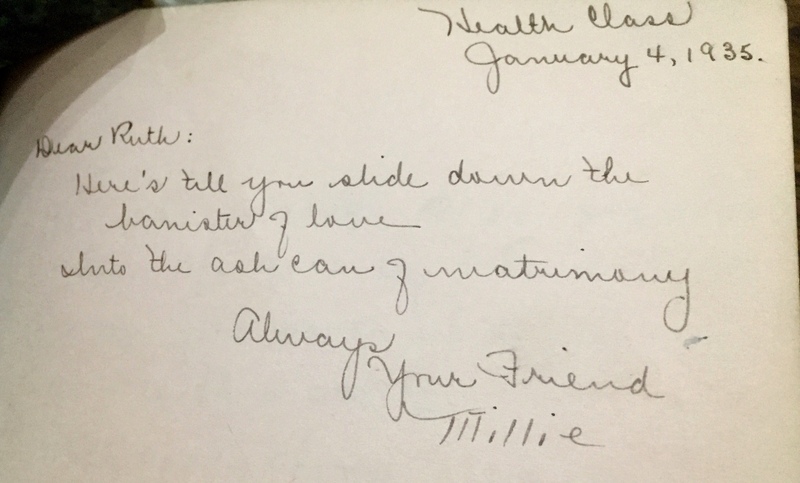 When my grandfather died after my grandmother, my sibs and I had to clean out his house and I found an autograph book exactly like the photo you showed here, except it was burgandy color. I always felt my grandmother was a cold person. She was mega old fashioned, even looked old when she wasn’t old, and not a person of many words. I got that same feeling when I saw some of the autograph comments that there was not much warm and fuzzy, rather, prim, proper and courteous. 🙂 Nothing exciting, lol. Really! Prim, proper and courteous? I’d characterize the ones in Ruthie’s book as mostly corny or quaint with just a few serious ones . . . nothing too original though. “Ach du lieber”, to coin a PA Dutch expression for the German, ACH MEINE GÜTE! I just read your posting of Aunt Ruthie’s Autograph. Wow! Amazing! I could not help but take a trip back on menmory’s lane 67+ years ago to the two room school house, and all of the experiences I have had with your aunt for the first four years of grade school. Those were the days when school started with Bible reading and prayer. Your aunt actually embellished it with playing songs on the piano. From grade school to high school and Miss Dulebohn’s Algebra class. I always entered that class with the “fear of God”. I did, however, really learn Algebra. I noticed that someone already corrected the German, Wer die Leute hinauf will, muss bei der untersten Sprosse anfangen – “if you want to get to the top , you must start at the bottom rung” – inference – ladder. That brought back memories also, since German was my favorite class at Etown, Oh! and speaking of Bible reading and prayer. My first class with your aunt started with it, and my last class on my last day (12th grade) ended with it. What a sad departure from the TRUTH. Marian, thanks for sharing. And thank you, Paul, for appearing in this column and for confirming the translation as a true teacher of German would do. Now we are Facebook and blog friends. I had not known you had Miss Dulebohn too several years after I was in her class. Yes, she was definitely a force for good. I am not surprised that German was your favorite class in high school. Mine was definitely not algebra – ha! I hope you’ll visit again. First thing that stands out is the excellent, easy to read penmanship. There was a time when hours were spent learning to write in script. It shows. Also the sweet innocence of the wishes–and the durability and endurance of math teachers. Finally, the wishes focused on soul and spiritual values rather than wishes for shapely bodies and big careers. I discovered a wonderful secret looking through my grandmother’s papers. She was 4 months pregnant when she and grandpa married. No one in the family knew, but there were the wedding papers from the Lutheran Church and also from the state of Ohio. The wedding was in 1914, less than 5 months before my mom was born. My mother and her siblings had died before I discovered this, so I don’t know if my mother knew. Probably not. Certainly none of my cousins knew. My grandparents kept their secret well. Thank you for another creative and thought-provoking post. It’s a lift to visit here. And it’s a lift to see your smile in this column too. The crazier the world gets the more convinced I am we must persist with kind and gentle. I know you agree. I love your grandmother story. Four months is about the time the waistline changes. Maybe a girdle was involved. There’s a scene in my memoir about a couple that had to endure public chastening because their baby arrived too soon after the wedding. When I was old enough to understand such things, I mentioned to my mother than my birthday was July 24, two days less than 9 months after their October 26 wedding. Mom said, “Nothing happened before we were married” and I believe her. There’s no denying though I was a honeymoon baby! 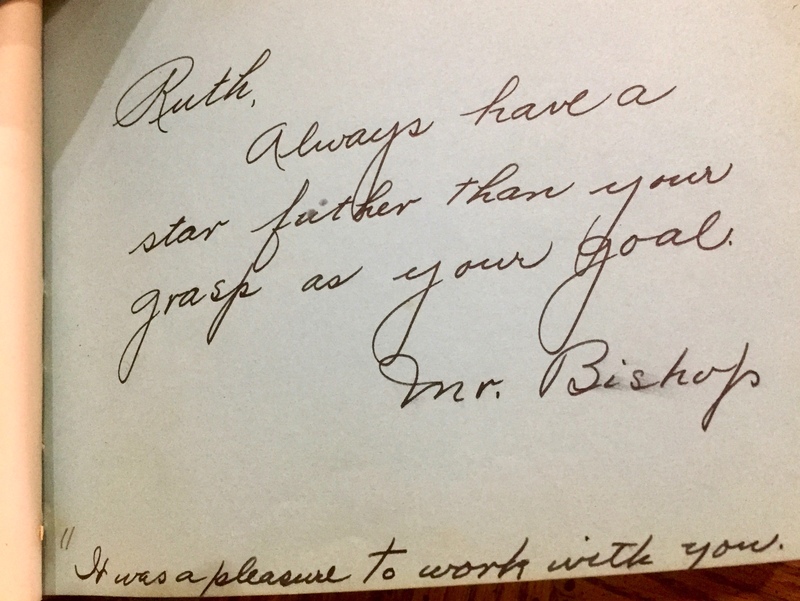 Some interesting names from your Aunt Ruth’s book: Miriam L., married to Herb Fisher, am I right on that? Was the Mary Hertzler possibly Frank Hertzler’s daughter Mary”, she was a childhood friend of my mother. Nancy G., is she that lady married to a Brubaker? and Fred Barley’s was killed in WW2 and buried in the Netherlands I believe, his one sister was a dear friend of mine from church. Small world. And Miss May Dulebohn–I’ve heard that name spoken among some of the Achenbach family! I believe most of what was posted as questions could be actual facts. Those who know may confirm or correct. Thank you!